Brazil’s role in the future of internet governance is closely linked to that country’s role in other global issues. 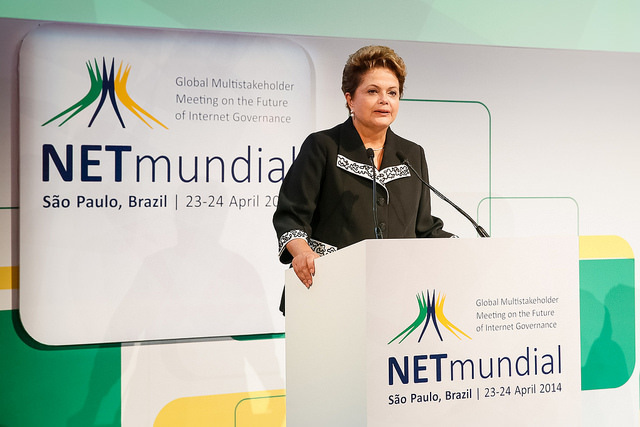 The NETmundial meeting, which concluded in Sao Paulo last week, was considered by Brazilian commentators as a crucial step in the Rousseff administration’s attempts to enlarge security and global control on internet and data transmission. It’s true that the Marco Civil da Internet is an agreement that included different interests, including foreign interests. But a national and political consensus was able to be reached. The problems of spying and security are not only a political issue; they depend on technological capacities. It’s true that US capacities are higher than those of other countries. Political, economic, and technological needs together with more balanced international relations will push, if not in the short-term most certainly the mid-term, for realistic international participation in web administration. In this sense, the NETmundial meeting is a concrete step in that direction. Rhodes and Armijo’s article helps elucidate these debates within Brazil and also sheds light on critiques of US dominance of internet governance. Yes, the Brazilian government insists on the need for less unilateralism and more multilateralism. At the same time, however, Brazil has realistic propositions that are valuable contributions to global discussions and decision-making.